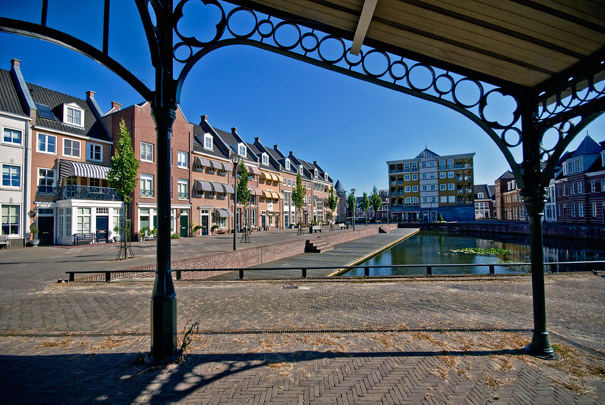 Brandvoort is the flagship project for retro-architecture in the Netherlands. At its centre is De Veste, a sub-area consisting of fort-like perimeter blocks with gateways and turrets, shot through with newly laid-out canals. The houses with their varied roof heights and facade architecture in traditional materials are to give the impression of a naturally evolved town. Its outlying areas are more open with freestanding houses inspired by farmsteads and colonial architecture. More than 6000 homes are to be built here by the year 2015. Participating architectural offices: H. van der Laan, H. Coppen, Saanen & Knoups Architecten, C.J.M. van de Ven, R. Lanfermeijer, Krier & Kohl en Magis en Van den Berg (Station Brandevoort, 2007).